1Department of Hematology, Faculty of Medical Sciences, Tarbiat Modarres University, Tehran, Iran. 2Hematology-Oncology and Stem Cell Transplantation Research Center, Tehran, Iran. 3Cell Therapy and Hematopoietic Stem Cell Transplantation Research Center, Tehran, Iran. 4Hematologic Malignancies Research Center, Tehran University of Medical Sciences, Tehran, Iran. 5Comprehensive Cancer Research Center, Mazandaran University of Medical Science, Sari, Iran. Received: June 7, 2018; Revised: August 27, 2018; Accepted: September 5, 2018; Published online: December 17, 2018. Recent studies have devoted much attention to non-protein-coding transcripts in relation to a wide range of malignancies. MALAT1, a long non-coding RNA, has been reported to be associated with cancer progression and prognosis. Thus, we here determined MALAT1 gene expression in chronic lymphocytic leukemia (CLL), a genetically heterogeneous disease, and explored its possible relationships with cytogenetic abnormalities. MALAT1 expression level was evaluated using real-time quantitative reverse transcription polymerase chain reaction (qRT-PCR) on blood mononuclear cells from 30 non-treated CLL patients and 30 matched healthy controls. Cytogenetic abnormalities were determined in patients by fluorescence in situ hybridization (FISH). MALAT1 expression level was up-regulated in the CLL group compared to healthy controls (P=0.008). Del13q14, followed by Del11q22, were the most prevalent cytogenetic abnormalities. We found no association between the FISH results and MALAT1 expression in patients. Altered expression of MALAT1 is associated with CLL development. Further investigations are required to assess the relationship between this long non-coding RNA and CLL patient survival and prognosis. Chronic lymphocytic leukemia (CLL), a common blood cancer in western world, is characterized by proliferation and accumulation of neoplastic CD5high B-cells in bone marrow, peripheral blood, and secondary lymphoid organs . It mainly affects the elderly, and the mean age at diagnosis is about 70 years. CLL is more common in male subjects. About 25–30% of all new leukemia cases can be attributed to CLL in the western population. However, CLL is rare in Asia and accounts for only about 5% of all leukemia cases . Several factors have been reported to increase the risk of CLL including occupational exposure to specific substances (ethylene oxide, benzene, 1,3-butadiene, and pesticides), ethnicity, positive family history of lymphoproliferative disorders, and genetic predisposition . CLL has a heterogeneous nature and involves numerous genetic and epigenetic alterations. Some patients need interventions due to progressive disease course, whereas subjects with indolent course require no therapy for years . Studies have revealed that only 2% of the human genome sequences are protein-coding genes, whereas the majority of transcriptome does not encode proteins. Non-coding RNAs (ncRNAs) are divided into regulatory and housekeeping classes. Regulatory ncRNAs are subcategorized, depending on the nucleotide length, into long (>200 nt) and short (<200 nt) ncRNAs. Long ncRNAs (lncRNAs) play important roles in multiple biological processes such as DNA repair, regulation of gene expression, transcription, and translation . Some lncRNAs, including MEG3, BANCR, and PANDAR, serve as tumor suppressor and inhibit tumor cell growth. Oncogenic lncRNAs, such as ALAT1 and HOTAIR, are upregulated in a variety of malignancies and lead to tumorigenesis, metastasis, and progression of cancers . MALAT1 (metastasis-associated lung adenocarcinoma transcription 1), also named NEAT2 (nuclear enriched abundant transcripts), is an 8.7 kb oncogenic lncRNA located on chromosome 11. It has a key role in alternative splicing and gene expression regulation. In vitro studies have shown that deregulation of TP53 by oncoviruses leads to increased expression of MALAT1 and upregulation of TP53 is associated with MALAT1 depletion . A recent study demonstrated that KG1 myeloid cell line have a higher expression level of MALAT1 than normal bone marrow cells . In multiple myeloma patients, progression-free survival was associated with decreased expression of MALAT1 . Although the precise molecular mechanisms by which MALAT1 may contribute to CLL pathogenesis have not been fully elucidated yet, several observations support the involvement of this lncRNA in CLL. These include its role in cell cycle regulation and p53-mediated response to DNA damage, as well as in mRNA processing. The emerging role of MALAT1 in hematologic malignancies prompted us to quantify its expression in patients with CLL to establish whether its deregulation may be associated with disease progression. In this study, we examined 60 subjects including 30 CLL patients and 30 healthy individuals in the period between 2016 and 2018. The CLL group consisted of 18 male and 12 female patients (mean age, 56.4 yr) and the control group included 15 male and 15 female subjects (mean age, 69.16 yr). Diagnosis of patients was based on standard guidelines including complete blood count, peripheral blood smear, and immunologic tests. The Ethics Committee of Tarbiat Modarres and Tehran University of Medical Science approved the study content and patients were given written informed consent. Notably, in our two years follow-up all patients were alive and only six of them received chemotherapy, as follows: one patient received chlorambucil and prednisolone, one patient received bendamustine and rituximab, and the rest four patients received R-CVP chemotherapy. Due to the limited number of patients in the different treatment groups, we did not evaluate MALAT1 expression in relation to treatment. About 10 mL of fasting venous blood were taken from all study participants. Blood mononuclear cells (MNCs) were isolated by ficoll lymphodex medium (Inno-Train Diagnostik, Kronberg, Germany). In brief, 5 mL of EDTA-containing blood were diluted by sterile phosphate buffer saline (PBS) in a 1:1 ratio and layered over 7 mL of lymphocyte separating medium in a sterile Falcon tube. The tube was centrifuged at 400 g for 30 min and the MNC-containing ring was transferred into a new tube and washed with PBS. Total RNA extraction was performed using RiboEx reagent (GeneAll, Seoul, Korea) After determination of RNA purity using a spectrophotometer, cDNA synthesis was performed by Revert Aid First Strand cDNA Synthesis Kit (Fermentas, Vilnius, Lithuania). In each reaction tube, 1–5 µg of total RNA, 1 µL of random hexamer primer, 4 µL of 10× buffer, 2 µL of dNTP mix, 1 µL of M-MuLV Reverse Transcriptase and nuclease-free water (up to 20 µL) were added. In order to evaluate MALAT1 gene expression levels, Real-time PCR was done in StepOne Real-Time PCR System (Applied Biosystems, Foster City, CA, USA) based on RealQ Plus 2x Master Mix (Ampliqon, Odense, Denmark). The following primers were used to amplify MALAT1 as target gene, F: GAATTGCGTCATTTAAAGCCTAGTT, R: GTTTCATCCTA CCACTCCCAATTAAT, and β2m as the housekeeping gene, F: GTGGAGCATTCAGACTTGTCTTT, R: TGCTTACATGT CTCGATCCCAC. The PCR program consisted of an initial holding stage at 95℃ for 15 min, 40 amplification cycles (95℃ for 15 s, 62℃ for 30 s, and 72℃ for 30 s), followed by melting curve analysis. We used 2−ΔCt method to compare the relative mRNA expression of MALAT1 and β2m between groups. Patient's bone marrow cells were cultured in complete medium containing RPMI 1640, fetal calf serum, and antibiotics for 24 h at 37℃. For the harvesting step, Colsemide and KCl were added to cultures. Next, the cells were fixed by methanol and acetic acid (3:1 ratio) solution. FISH was performed on prepared slides using a panel of probes to detect chromosomal anomalies including deletion of 13q14.3, 17p13, 11q22.3, 6q21, trisomy 12, and c-MYC translocation. SPSS software (version 18) was applied for data analysis. One-way ANOVA, independent t-test or Mann-Whitney U test was used to compare quantitative data between CLL patients and healthy controls. A P-value ≤0.05 was considered statistically significant. Demographic and clinical information on study participants is listed in Table 1. White blood cells and lymphocyte count were higher in CLL patients. Platelet count and hemoglobin levels were significantly higher in healthy controls. There were no gender-related differences in the groups. According to FISH findings, 20% of patients showed a normal chromosomal pattern. Del13q14 was the most common cytogenetic abnormality as it was found in 53.3% of patients, followed by del 11q22 (16.6%), del 17p13.1 (10%), trisomy 12 (10%), and c-MYC amplification (3.3%). The expression levels of MALAT1 were normalized to the internal control β2m to obtain the relative threshold cycle (ΔCT). As shown in Fig. 1, MALAT1 was upregulated in the CLL group (P=0.008). Based on cytogenetic findings, we categorized patient prognosis into three groups, i.e., poor (17p13.1 and 11q22.3), intermediate (trisomy 12 and normal karyotype), and good (13q14.3 if sole abnormality). No statistically significant differences were observed between the prognosis categories in relation to MALAT1 expression levels (Table 2). Malignancies are a global health issue and are the 3rd cause of mortality in Iran. In this context, the increase in the recorded incidence of blood cancers in Iran can be attributed to several causes including improvement in cancer diagnosis setting and registry and increase in cancer-related risk factors or unknown etiologies . With the advancement of biotechnological tools, studies have devoted much attention to genetic alterations as an inseparable part of cancer. In this respect, non-protein-coding transcripts such as lncRNAs play a critical role in regulating cellular functions and may be related to both tumor suppressive and oncogenic characteristics. According to recent evidences, lncRNAs are involved in many principal cellular mechanisms such as transcriptional and post-transcriptional regulation, chromatin rearrangement, and nuclear-cytoplasm trafficking . Deregulation of lncRNA expression has been reported in a variety of human diseases, from neurologic disorders (multiple sclerosis and Alzheimer's disease) to several solid (breast, lung, bladder) and hematologic cancers (lymphoma and leukemia) . Initially described as a metastasis biomarker of lung cancer, MALAT1 lncRNA is a pivotal player in the molecular events behind neoplastic transformations In this regard, we examined MALAT1 expression in PBMCs of pre-treatment CLL patients compared to healthy controls, by real-time PCR. Cytogenetic analysis was also performed in patients to determine any possible association between MALAT1. Significantly higher expression of MALAT1 was found in patients, compared to controls. However, MALAT1 expression was not related to the prognostic classification based on cytogenetic alterations in patients. Significantly higher expression of MALAT1 was found in patients, compared to controls. However, MALAT1 expression was not related to the prognostic classification based on cytogenetic alterations in patients. Several genetic and epigenetic events take part in CLL such as chromosomal abnormalities, deregulation of microRNAs, immunoglobulin VH mutations and, more recently, changes in lncRNA expression profiles . Given that in-vitro studies have paid limited attention to the expression and functional characteristics of MALAT1 in CLL cell lines, some explanations are provided with impressions of studies. It was shown that MALAT1 knock-down in multiple myeloma (MM) cell lines results in caspase-dependent cell death. This finding is relevant in view of the fact that proteasome inhibitors are useful therapeutic agents for both MM and CLL . Dysfunction of TP53 and retinoblastoma (Rb) tumor suppressors, which are associated with a wide range of cancers including CLL  could be mediated by MALAT1, as depletion of this lncRNA leads to activation of TP53 and its target genes . Previously, the overexpression of MALAT1 observed in patients with the M5 subtype of AML was found associated with lower overall survival. Furthermore, MALAT1 knock-down by Lentiviral vectors was shown to increase apoptosis and inhibit proliferation of leukemic cells . In mononuclear bone marrow cells of multiple myeloma (MM) patients, MALAT1 was overexpressed, whereas a decrease in MALAT1 resulted in improved progression-free survival . Isin et al. performed a study to determine cell-free lncRNA profile in MM and CLL patients. MALAT1 was downregulated in MM patients, whereas no significant differences were observed between CLL patients and healthy controls which is discordant with our findings. Similar in-vitro and in-vivo investigations have been carried out focusing on MALAT1 expression in different types of lymphoma, including lymphomas of mantle cell , diffuse large B-cell , and T and NK cell lymphomas . All these studies reported that MALAT1 upregulation was associated with poor prognosis. There are several factors related to CLL prognosis including VH mutation status, zeta-associated protein (ZAP-70) and CD38 expression, and chromosomal aberrations . We determined chromosomal abnormalities in patients using the FISH method and 80% of them presented cytogenetic abnormalities. On the contrary, findings from the northeast of Iran (Mashhad) revealed a lower frequency of chromosomal abnormalities in CLL patients (45.5%); however, in line with our data, del13q14 was the most frequent alteration. In Korean patients, a lower overall frequency of abnormalities was observed, compared to western populations and the present report, and also a different frequency distribution, as trisomy 12 represented the most common chromosomal alteration found . Despite the high incidence of chromosomal anomalies in this study, no significant relationships were found between the level of MALAT1 expression and the prognostic classification based on cytogenetic results. Failure to determine other prognostic factors and a relatively small sample size may be responsible for this result. As it is also possible that MALAT1 acts as an independent prognostic factor, additional studies should be designed to investigate its impact on patient survival. As it is also possible that MALAT1 acts as an independent prognostic factor, additional studies should be designed to investigate its impact on patient survival. In conclusion, a high expression of oncogenic MALAT1 lncRNA in CLL patients may reflect its involvement in tumorigenic processes. Further studies are required to establish the suitability of MALAT1 determination for diagnostic and therapeutic applications in CLL. Relative expression of MALAT1 (2−Δct) in CLL and control group using β2m as internal control gene. Increased expression of MALAT1 was observed in CLL patients (P=0.008). Demographic and clinical information on study participants. a)Clinical stage of CLL patients according to Rai staging system. Abbreviations: CLL, chronic lymphocytic leukemia; WBC, White blood cells. MALAT1 expression levels in the different FISH prognosis categories. Good: 13q14.3 (sole abnormality); intermediate: trisomy 12 and normal karyotype; Poor: 17p13.1 and 11q22.3. Herishanu Y, Katz BZ, Lipsky A, Wiestner A. Biology of chronic lymphocytic leukemia in different microenvironments: clinical and therapeutic implications. Hematol Oncol Clin North Am 2013;27:173-206. Bauer K, Rancea M, Roloff V, et al. Rituximab, ofatumumab and other monoclonal anti-CD20 antibodies for chronic lymphocytic leukaemia. Cochrane Database Syst Rev 2012;11:CD008079. Charbotel B, Fervers B, Droz JP. Occupational exposures in rare cancers: A critical review of the literature. Crit Rev Oncol Hematol 2014;90:99-134. Inamura K. Major tumor suppressor and oncogenic non-coding RNAs: clinical relevance in lung cancer. Cells 2017;6:E12. Tripathi V, Shen Z, Chakraborty A, et al. Long noncoding RNA MALAT1 controls cell cycle progression by regulating the expression of oncogenic transcription factor B-MYB. PLoS Genet 2013;9:e1003368. Ahmadi J, Kaviani Gebelli S, Atashi A. Evaluation of MALAT1 gene expression in AML and ALL cell lines. Faslnamahi Kumish 2015;17:179-186. Cho SF, Chang YC, Chang CS, et al. MALAT1 long non-coding RNA is overexpressed in multiple myeloma and may serve as a marker to predict disease progression. BMC Cancer 2014;14:809. Janbabaei G, Hedayatizadeh-Omran A, Alizadeh-Navaei R, et al. An epidemiological study of patients with breast cancer in Northern Iran, between 2006 and 2015. WCRJ 2016;3:e803. Dykes IM, Emanueli C. Transcriptional and post-transcriptional gene regulation by long non-coding RNA. Genomics Proteomics Bioinformatics 2017;15:177-186. Li J, Xuan Z, Liu C. Long non-coding RNAs and complex human diseases. Int J Mol Sci 2013;14:18790-18808. Eftekharian MM, Ghafouri-Fard S, Soudyab M, et al. Expression analysis of long non-coding RNAs in the blood of multiple sclerosis patients. J Mol Neurosci 2017;63:333-341. Rahimi H, Sadeghian MH, Keramati MR, et al. 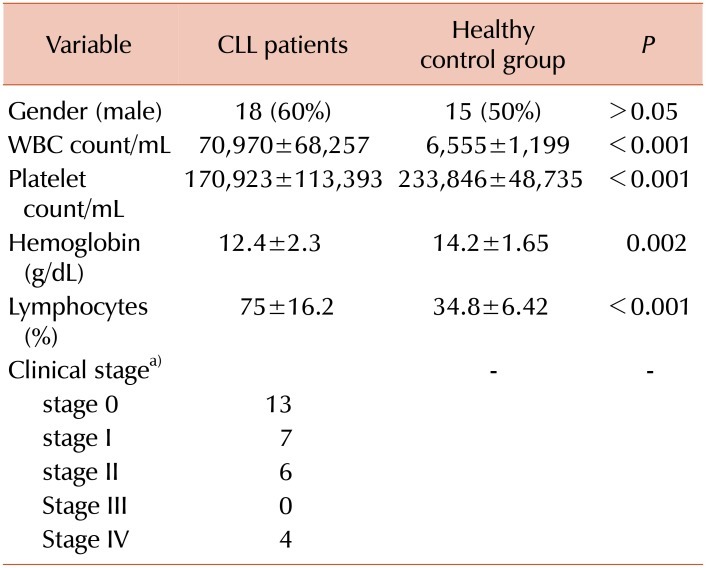 Cytogenetic abnormalities with interphase FISH method and clinical manifestation in chronic lymphocytic leukemia patients in North-East of Iran. Int J Hematol Oncol Stem Cell Res 2017;11:217-224. Balatti V, Pekarky Y, Rizzotto L, Croce CM. miR deregulation in CLL. Adv Exp Med Biol 2013;792:309-325. Sadighi S, Jahanzad I, Ali Mohagheghi M, et al. Somatic mutation in immunoglobulin gene variable region in patients with chronic lymphoid leukemia and its influence on disease prognosis. Middle East J Rehabil Health Stud 2016;2:e35848. Ronchetti D, Manzoni M, Agnelli L, et al. lncRNA profiling in early-stage chronic lymphocytic leukemia identifies transcriptional fingerprints with relevance in clinical outcome. Blood Cancer J 2016;6:e468. Amodio N, Stamato MA, Juli G, et al. Drugging the lncRNA MALAT1 via LNA gapmeR ASO inhibits gene expression of proteasome subunits and triggers anti-multiple myeloma activity. Leukemia 2018;32:1948-1957. Lamothe B, Cervantes-Gomez F, Sivina M, Wierda WG, Keating MJ, Gandhi V. Proteasome inhibitor carfilzomib complements ibrutinib’s action in chronic lymphocytic leukemia. Blood 2015;125:407-410. Kuhn DJ, Chen Q, Voorhees PM, et al. Potent activity of carfilzomib, a novel, irreversible inhibitor of the ubiquitin-proteasome pathway, against preclinical models of multiple myeloma. Blood 2007;110:3281-3290. Zent CS. Time to test CLL p53 function. Blood 2010;115:4154-4155. Kay NE, Suen R, Ranheim E, Peterson LC. Confirmation of Rb gene defects in B-CLL clones and evidence for variable predominance of the Rb defective cells within the CLL clone. Br J Haematol 1993;84:257-264. Huang JL, Liu W, Tian LH, et al. Upregulation of long non-coding RNA MALAT-1 confers poor prognosis and influences cell proliferation and apoptosis in acute monocytic leukemia. Oncol Rep 2017;38:1353-1362. Isin M, Ozgur E, Cetin G, et al. Investigation of circulating lncRNAs in B-cell neoplasms. Clin Chim Acta 2014;431:255-259. Wang X, Sehgal L, Jain N, Khashab T, Mathur R, Samaniego F. LncRNA MALAT1 promotes development of mantle cell lymphoma by associating with EZH2. J Transl Med 2016;14:346. Li LJ, Chai Y, Guo XJ, Chu SL, Zhang LS. The effects of the long non-coding RNA MALAT-1 regulated autophagy-related signaling pathway on chemotherapy resistance in diffuse large B-cell lymphoma. Biomed Pharmacother 2017;89:939-948. Kim SH, Kim SH, Yang WI, Kim SJ, Yoon SO. Association of the long non-coding RNA MALAT1 with the polycomb repressive complex pathway in T and NK cell lymphoma. Oncotarget 2017;8:31305-31317. Kokhaee P. B-cell chronic lymphocyte leukemia (B-CLL). Faslnamahi Kumish 2007;9:1-12. Yoon JH, Kim Y, Yahng SA, et al. Validation of Western common recurrent chromosomal aberrations in Korean chronic lymphocytic leukaemia patients with very low incidence. Hematol Oncol 2014;32:169-177.